I am loving all the Patriotic projects that have been shared on the CutCardStock blog, aren't you!? Today I am back with another quick and easy patriotic card using the Malmero Perle carstock collection! This cardstock is 92# and has a soft subtle sparkle that really catches your eye! 1. 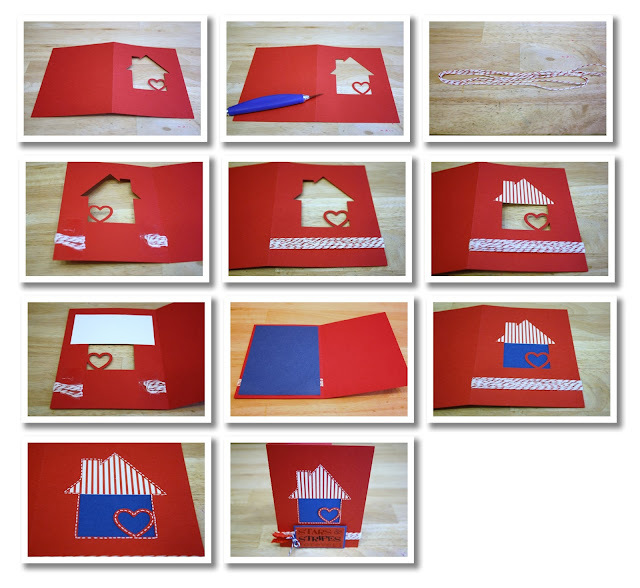 Cut out the home card digital cut using the Red Sparkle Cardstock and fold on the score line. 2. With a craft knife, cut a 1"slit in the score area, this will be used to slide the twine through. 3. Cut a long piece of twine and fold several times. 4. Push one end of the twine through the slit and then pull the other end around the side of the card. Tape the ends down. 5. The front of the card will look like this. 6. Cut a piece of patterned paper to cover the roof of the house. 7. Adhere it on the inside of the card as shown. 8. Cut a piece of the Blue Sparkle Cardstock to mat the back of the card and adhere as shown. 9. The front of your card will now look like this! 10. Use the White Uniball Signo Pen to create dashes around the house and heart. 11. Mat the sticker on the Red Sparkle Cardstock and then mat those on the Blue Sparkle Cardstock and adhere that with foam adhesive in the center of the twine. Cut a scallop border then add ribbon and twine to embellish! Click on photo to see more! ©2009-2019 Jamie Lane Designs. Images and designs are for your inspiration and personal use only. All photography and art on this website are my own, subject to copyright, and and cannot be used without my written consent. Thanks! As an agreement with the companies and teams that I design for and work with, I often receive product &/or compensation for my work. The thoughts and opinions in my blog posts are mine and I only promote the items and companies that I use myself and feel strongly about.